Much like the rest of, well, everyone… I had a strong reaction to Marie Kondo’s Netflix show, in more ways than one. One of the things that keeps showing up for me this year, is cleaning out the old, so you can make space for the new. Whatever that may be. After binge watching “Tidying Up”, I had a very emotional reaction to the amount of clothing I possessed. It took me about a week and a half from start to finish, but 6 huge bins and bags later, I had cleaned out about 70% of my closet, and yet somehow it still looks as though I have more, way more, than enough. It’s because I do, and that still doesn’t sit well, so I’ll be paring back even more as the year goes on, and I see what I really find to be a necessity. As I stared at the enormous pile I had cleaned out, and the excess of what was still left behind, I felt largely like a terrible human. It took a while for me to shake that feeling, but it led me to something I’d considered for a long time- making the conscious decision to move away from fast-fashion impulse purchases, and focus more on supporting sustainable brands. I’ve always been a big proponent of thrifting, and shopping secondhand. That’s generally been my go-to if there’s something in particular I’m searching for. 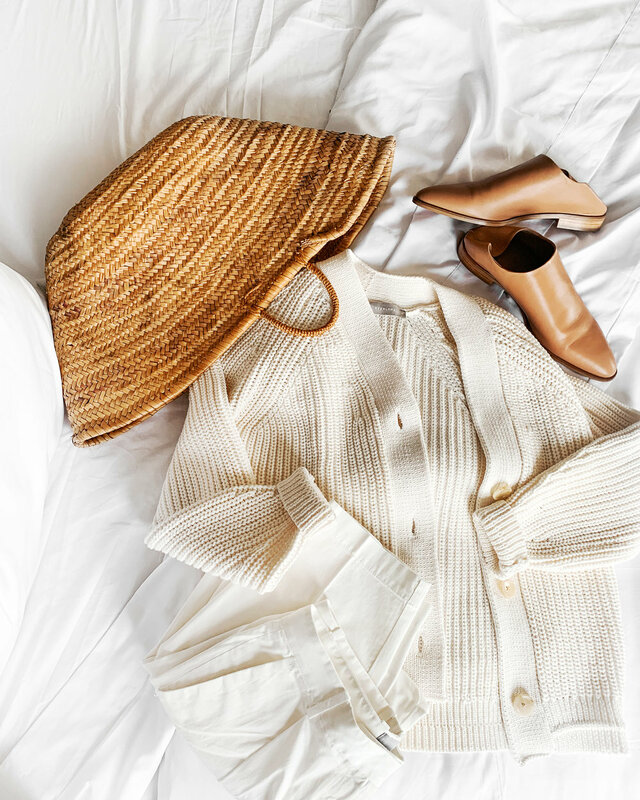 I think because that’s been a big part of my closet process thus far, the break up doesn’t seem too scarily monumental, but the idea of building a mindful closet got me thinking about which staples I always reach for again, and again, regardless of season. I have a handful of favorites that I wear year-round, neutral in palette, and generally perfect for all of the weather transitions. I don’t wear a lot of dark clothing, this fact was reiterated to me tenfold when I did my big closet purge. I was left with a very natural palette across the board. I lean on so much white, grey, navy blue, color and prints for summer, and maybe 5 black pieces total (I don’t even own black jeans!). Seeing it condensed down helped to visually understand what I actually love wearing on a regular basis. I’ve always loved Everlane. I bought my first t-shirt back when I lived in NYC and they had just launched. Suffice to say, I’ve been a big fan since day one. They’re my go-to for pieces that I know will feel effortless, adaptable, and long-lasting. If you’re looking to build a more mindful closet, I can’t help but strongly point you towards them to get started. For this time of year in particular, that in between cool and warm, sunny days and chilly nights, their modern babo, slouchy chino pant, and cotton cardigan have been the perfect pieces to help me transition.